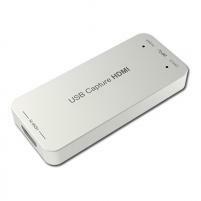 Have you ever wanted to stream video from your video camera, gaming system, or similar HDMI device? The USB 3.0 HDMI Video Capture Dongle works great with GNU/Linux's premier Open Broadcaster Software (OBS). Just plug it in, select the video capture device, and hit stream. Genuinely Penguin friendly with all recent Linux and Linux-libre kernels supported out of the box. Want to learn more? Check out the video demo. Notes: One of the popular free software applications commonly used in conjunction with this device called OBS (Open Broadcaster Software) may depend on a patent encumbered audio codec (AAC) depending on the directions followed and distribution. For Trisquel 8 users we have written up directions on our support page to avoid this unnecessary dependency. Customers within the United States can expect to receive this item within 3-4 business days when selecting our USPS shipping option. Most others in populated regions will generally get it within 1-3 business days from our US warehouse via DHL upon which taxes/duties/fees typically must be paid. Taxes and duties will be due upon delivery for most users outside of the US.